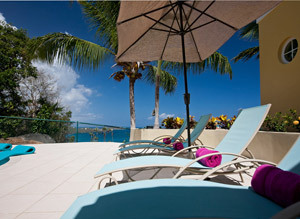 Children Welcome Yes - over 8 years old only, please. A signed Liability Waiver is required for all children under 15 years old, please, prior to arrival. 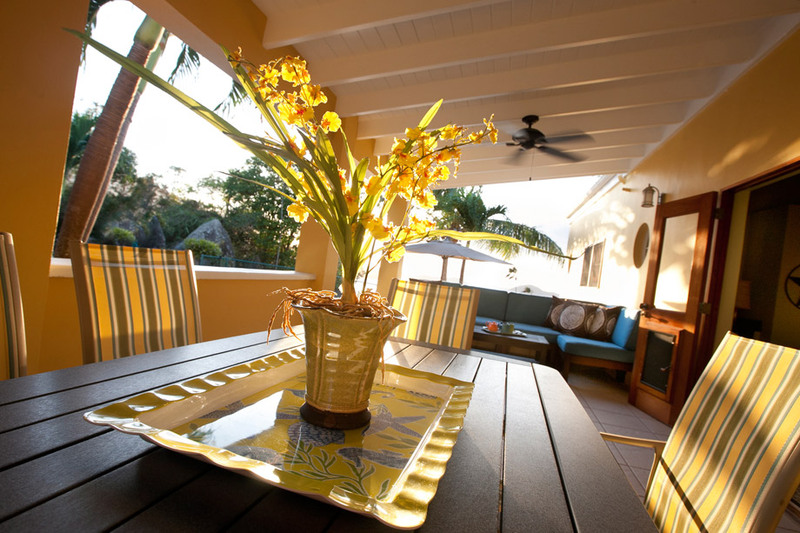 Spacious, conveniently situated and built all under one roof, designer-furnished Sunswept was just completely remodeled in late 2012 and decked out in elegant and colorful style. 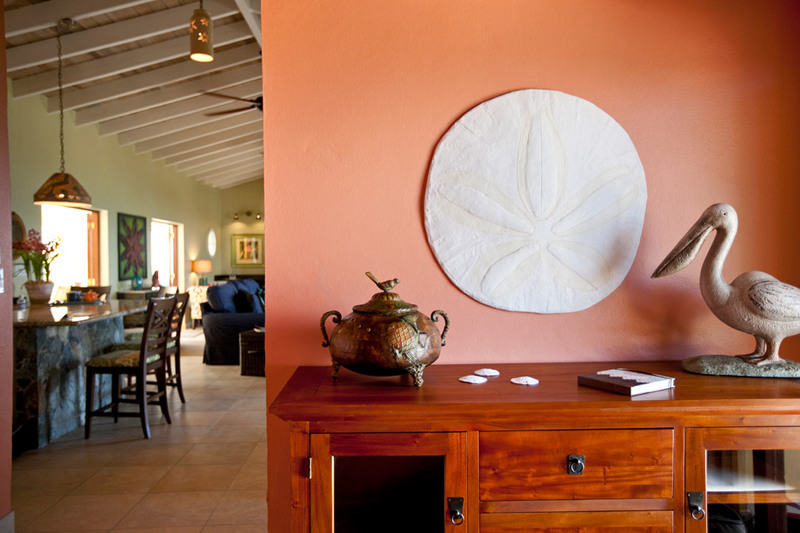 Located within exclusive Sydney's Fancy, a secure gated neighborhood just up the road from Magens Bay beach, Sunswept is so easy to access. A paved driveway borders the front of this villa and provides both entry and exit from either end. A short walkway leads up to Sunswept's front porch and the front door - no stairs to climb. Entering the foyer into the cool air-conditioning, the expansive Great Room is just to your right, and the stylish formal dining area for six is to your left. 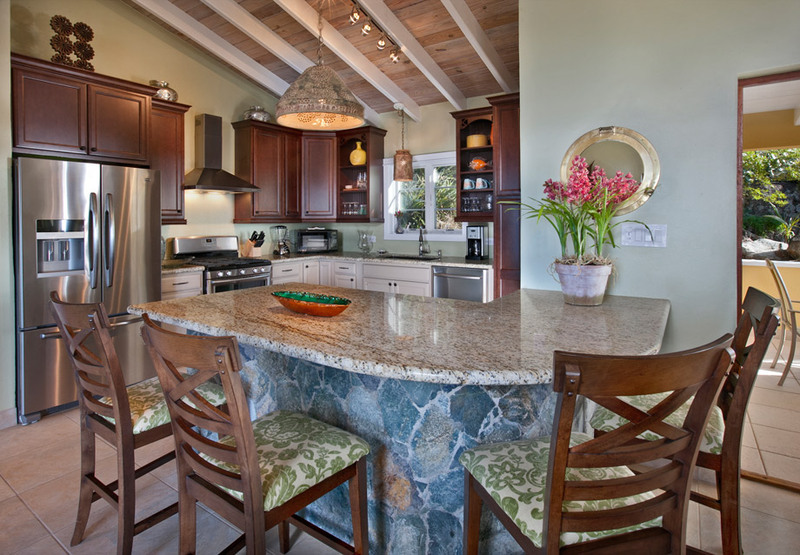 The Great Room shares space with the gourmet kitchen, beautifully done with custom cabinetry, stainless steel appliances, granite countertops and a bluebit stone counter with bar stools. 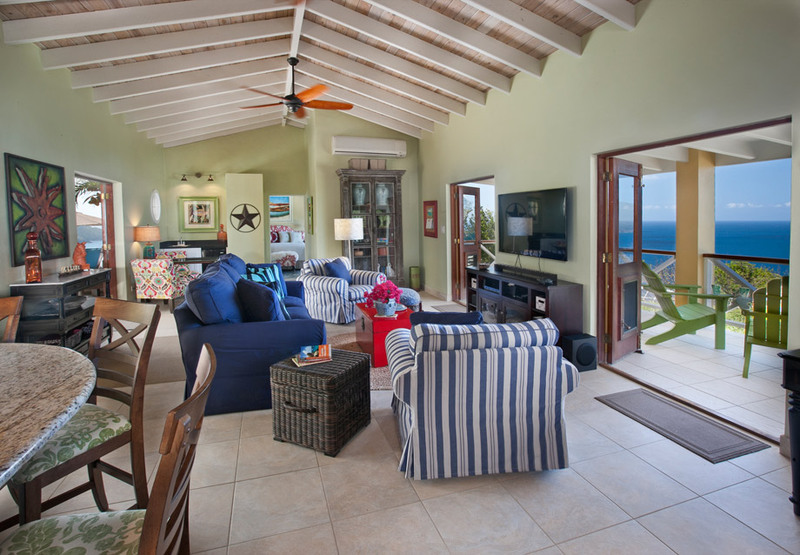 A sink-into sofa and easy chairs flank the large flat-screen TV; there's a desk for your laptop if you have to work a little, and a handy wet bar with a mini-fridge in the corner of the Great Room. 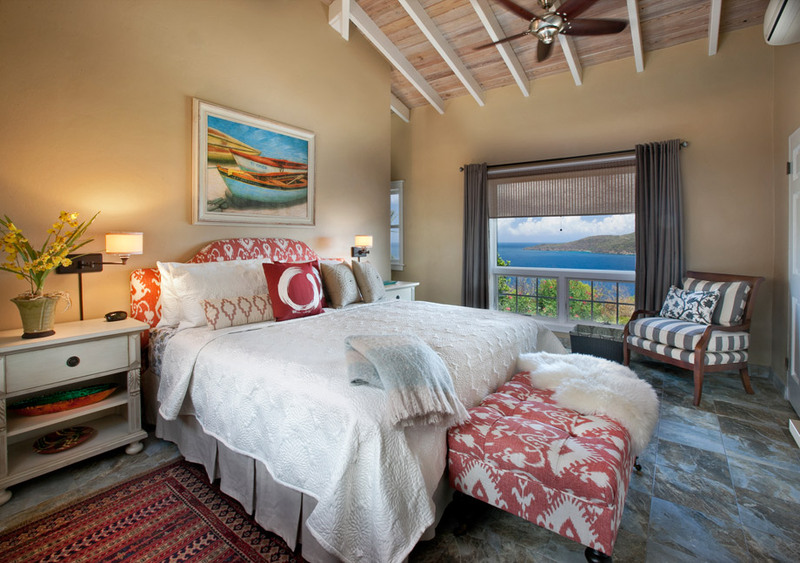 Just beyond the Great Room is the king master bedroom, a plush room with a large window framing the down-island ocean views. The ensuite bath features a tiled shower and a vanity with double sinks. 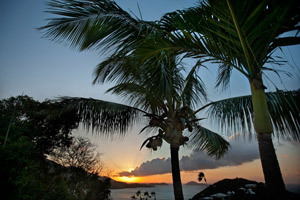 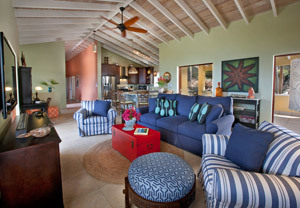 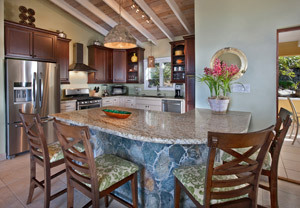 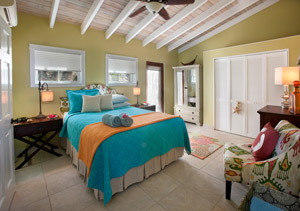 Above the vanity is another large window which showcases sunset views of Magens Bay and beyond. 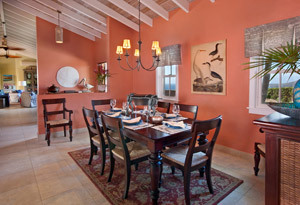 On the other side of the Great Room are the dining room and two finely-decorated queen bedroom/bath suites. From the Great Room, french doors open to a spacious outdoor living area in back of the villa, a roofed pavilion furnished with a cushioned sectional sofa and a table for alfresco dining, with a Weber gas grill nearby for burgers and steaks. 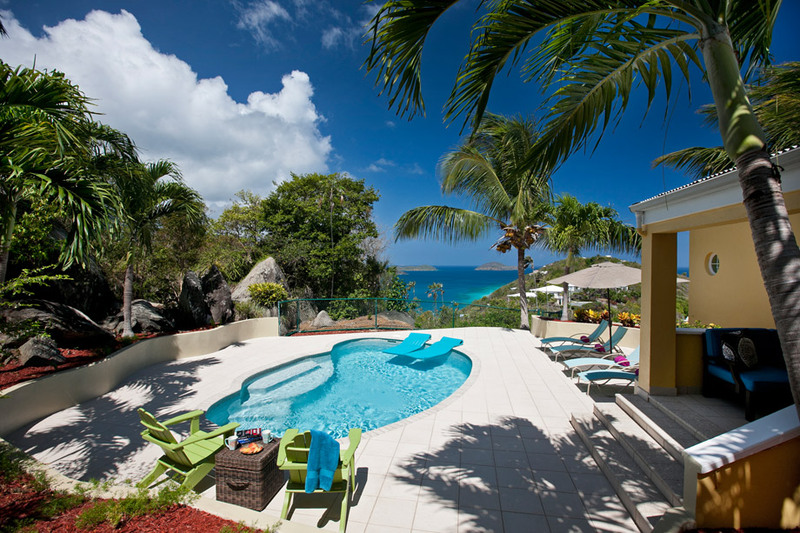 Just beyond, surrounded by large boulders, tropical landscaping and trees, is the very private tiled sun terrace and oval swimming pool which looks out over the superb Magens Bay ocean view. 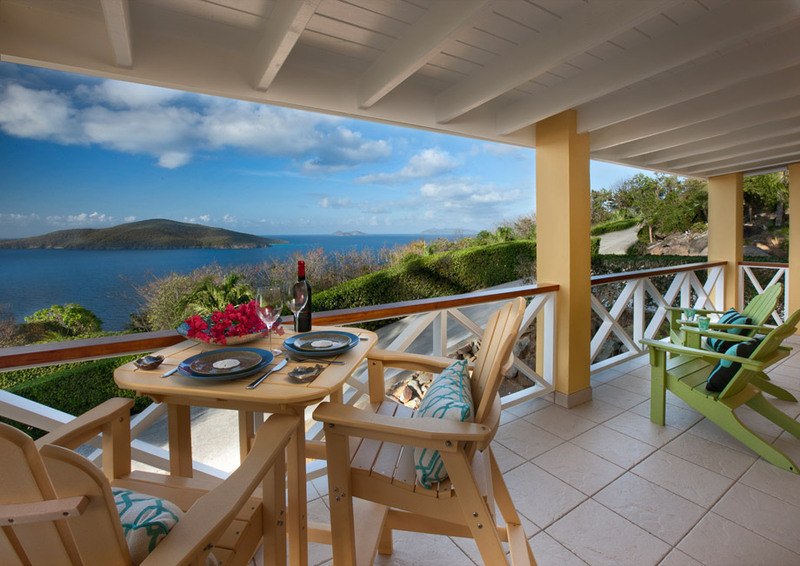 A second covered porch, on the front of Sunswept, is accessed via french doors from the Great Room and features a table and chairs from which to savor the cool island tradewinds and a spectacular view of Hans Lollick and the British Virgin Islands on the blue horizon. 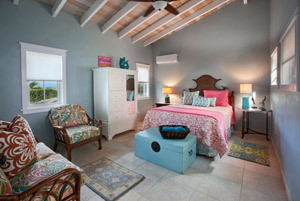 Sunswept offers plush comfort and charming decor, and plenty of space for everyone. 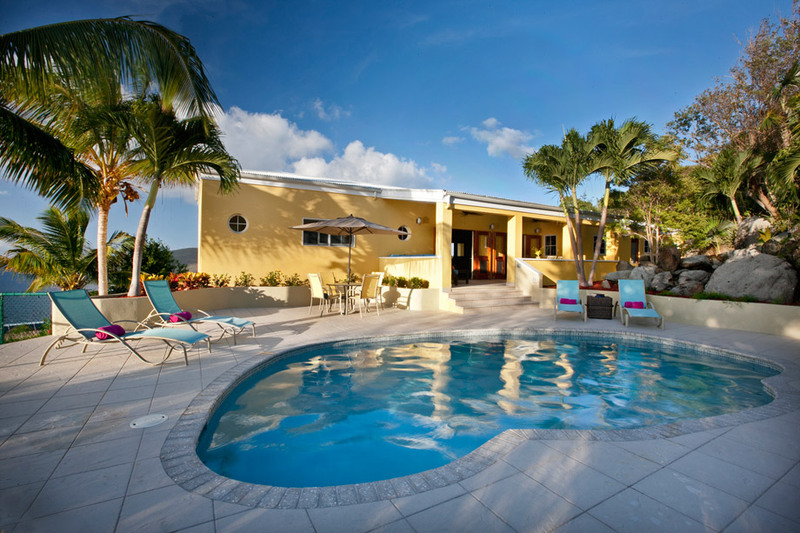 The entire villa is air-conditioned. 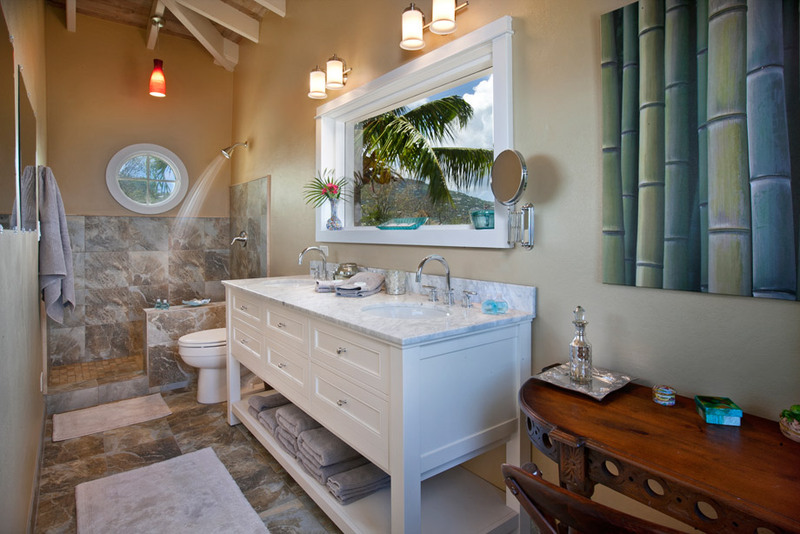 Sunshine and tropical light brighten Sunswept through artfully-situated windows. 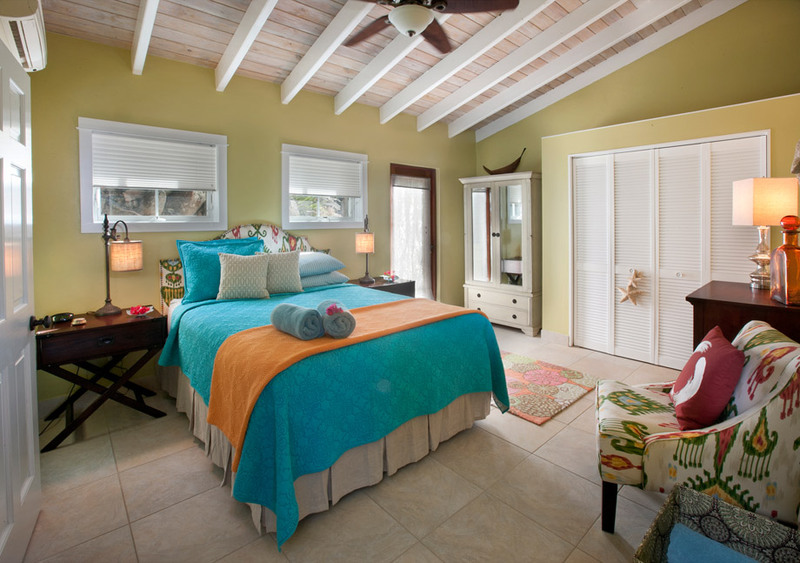 And excepting the laundry room downstairs, there are no flights of stairs to climb, and driving in and out of the property is easy. 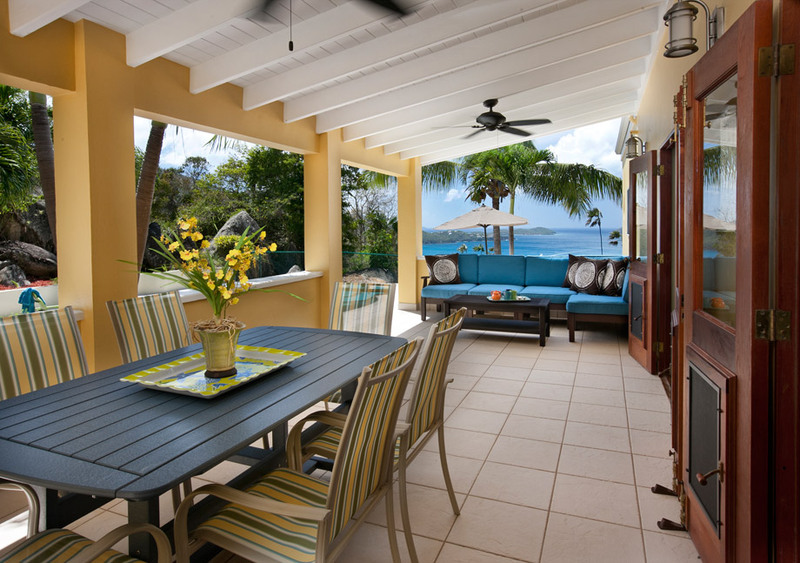 Enjoy morning coffee on the front porch with its lovely views to the east, and move to the back porch later, to catch a colorful sunset and celebrate another day in Paradise with cold cocktails. 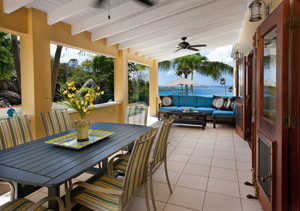 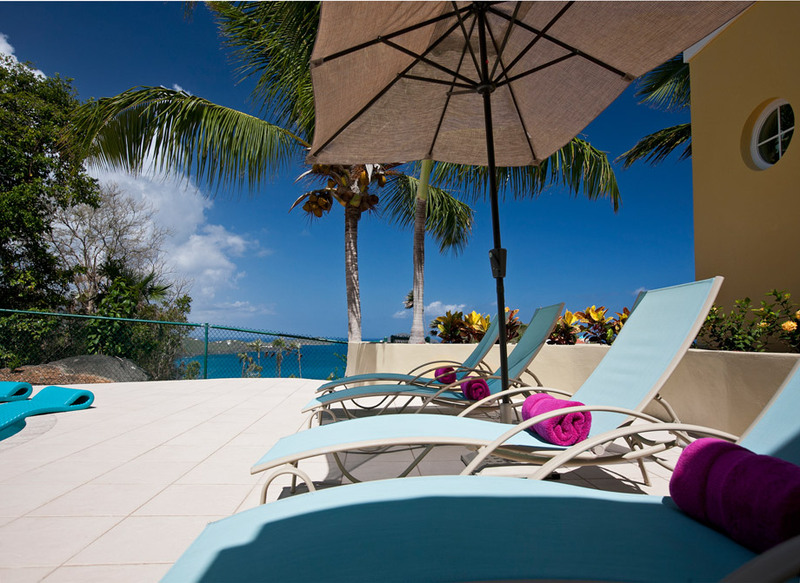 Sunswept is ideal for your comfortable and carefree Caribbean vacation, so please be sure to book early! Last-minute rental special: All 7-night (or more) rentals at Sunswept reserved within 30 days of arrival date will receive 1 night free. Holiday time periods excluded; also subject to terms found at the bottom of the villa promotions page on our web site.